One week after Doug Pederson game-planned his way to a defensive struggle win over the Atlanta Falcons, his Eagles routed the favored Minnesota Vikings 38-7 and earned Philadelphia its first NFC championship since 2004. The Vikings started strong, marching straight down the field to open up a 7-0 lead. 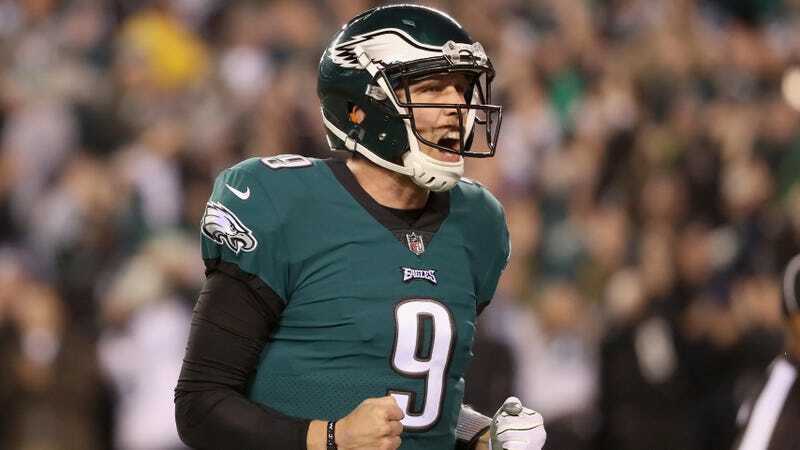 The Eagles then responded with 38 straight points, including multiple deep touchdowns thrown by Nick Foles, who demonstrated more arm strength and skill under pressure than he ever has in his professional career. After a month of apparent fear of throwing to Alshon Jeffery in traffic, Foles hit him for a 53-yard bomb in the first half, and then topped that with a 41-yard flea-flicker to Torrey Smith in the second half. The Philadelphia defense harassed Case Keenum all night and picked him off twice, including a 50-yard pick-six to tie the game at 7-7. Foles will next lead the Eagles into battle against the cowardly and morally decrepit New England Patriots in Super Bowl 52. Meanwhile, the fans in Philadelphia are doing... things. The Patriots Are Returning To The Super Bowl. Barf Barf Barf.